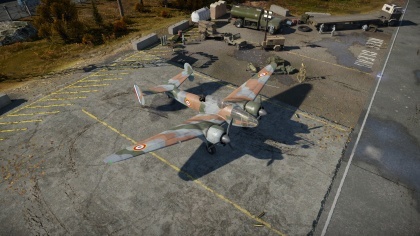 The M.B.174A-3 is a Rank II French frontline bomber with a battle rating of 2.7 (AB/RB/SB). It was introduced in Update 1.73 "Vive la France". 8 mm Steel plate behind the pilot's head. The two machine guns are arranged with one mounted in each wing. Each is armed with the same amount of ammunition, which means that all guns will fire with each other until empty. M.B.174 is rather maneuverable flying in a straight line since the aircraft can roll pretty well and has acceptable elevator motion. When in a combat situation, this changes considerable as the plane is difficult to handle in dives and turns. Trying to approach a bombing target in a diving turn, the M.B.174 is very slow to turn around and the bow keeps pointing way off the line of flight. Even using full rudder control, the bow of the plane just does not follow the turn, making it likely that the bombs will miss their target. The 50 kg bombs are not effective against any ground targets so it is imperative to research the heavier loads immediately. In attack mode, the 7.5 mm MG don't make much of a dent on enemies, and since ammo runs out quickly, any attack must be carefully planned. 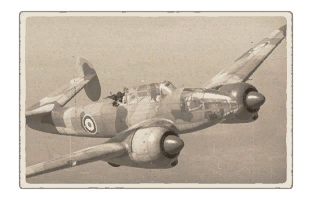 In addition, the M.B.174 does not conserve energy well and trying to climb will reduce speed to under 200 km/h, in which case the pilot can expect to be toasted if there are enemies anywhere in the vicinity. Tactics should be focused on bombing ground targets with a straight line approach and a clear exit away from the enemy. Attacking bombers at higher altitude is not advisable. Fighters busy in turn fights can be attacked if you have an altitude advantage and a line of exit. Extremely maneuverable for a bomber. Has offensive armament, though weak, many bombers cannot say the same. Need to use rudder heavily in diving turns.